In his kindergarten class, Oliver is exploring the theme of 'butterflies'. They had a huge net of cocoons (poor things didn't have a very restful incubation period :() which eventually resulted in the beautiful metamorphosis the children had been waiting for. Now, some guys did NOT make it. Oliver explained to me that that is just the nature of things. Oh dear! I am sure I will be hearing more about the ins and outs of a butterfly's life and nature as the month goes on. For now, we parents delighted in the childrens' artistic interpretations of their new friends! Do you miss school research projects too? Have any that really stand out as favorites? I do miss having the time to delve into a subject, and I remember being fascinated by things and excited to learn. At some point in my academic career, research became less exciting and more focused. But I do miss those days spent in libraries in college and grad school. I guess today most research is probably done online, so kids must have a different experience. But occasionally, I will walk into a library and get an overwhelming feeling of nostalgia for my student days. 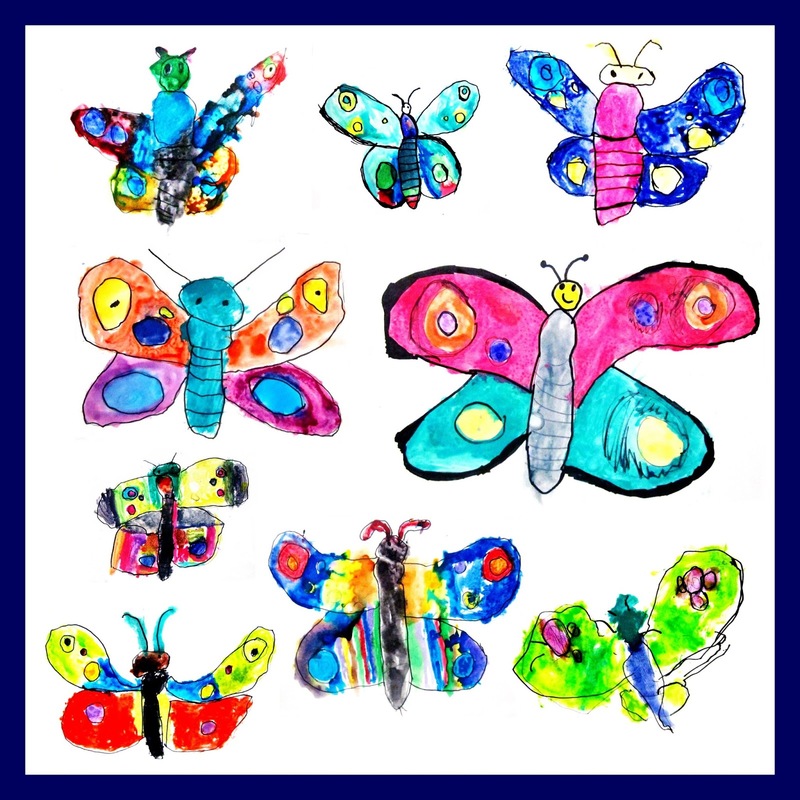 I love the butterfly paintings...wonderful! Oh yes...my university study memories live in quite a different place of my mind. There was more pressure, more structure...such VOLUME! But the projects of my grade school days...either I was doing them wrong, or they were just wonderful! Those butterfly artworks are pretty amazing! Sorry about those that didn't make it, though. Poor things. I loved researching things in elementary school. Taking trips to the library, and trying to find everything that I could on a subject. Maybe I should do that again! I love the butterfly with the yellow smiley face, he (or she) looks so cheerful!